What are the advantages of juicing? We all know that fruits and vegetables are good for us. But most of us don’t get the servings to keep us healthy and active in our daily lives. Often times our biggest complaint is the fact we can’t find a way to fit all those delicious foods into our daily diet. But we can, and juicing is the solution. Not only can you get your daily dose of fruits and vegetables in a few glasses of juice, but you can add things to it to add additional health benefits. For example, adding ginger or garlic can increase the immunity value of the drink you are making. If you are feeling ill, you can even adjust the amount of Vitamin C rich fruits you place in the drink to boost your immunity. But even past that immunity, the benefits of juicing that you are receiving include all the vitamins and nutrients of this fantastic fruit. This aids your body in the detoxification process. In fact, some people will focus on only drinking juice for several weeks to help cleanse their body of the unwanted toxins that build up in it. 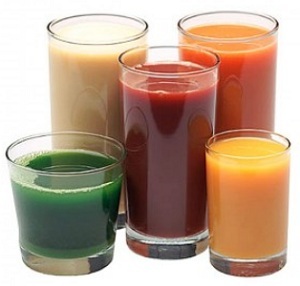 Another great benefit of drinking the fruit juices is your digestion will improve. The contents of the fruits and vegetables you will be ingesting help your bowel flora to replenish and to grow. These little creatures are the reason your body can break down the foods you eat, grasping at the nutrients while removing the waste. Another one of the advantages juicing is that it can help you to lose weight too. By drinking the juice it helps to fill your cravings for food, while adding a sweet taste to curb your desire for unhealthy sweets you might be considering. Plus the enzymes in many fruits and vegetables help to boost metabolism and give you more energy to make it through a day. If the health aspect of it was all a person received, it certainly would be enough. But there is so much more. People who drink their own juicing tend to have clearer skin, better hair and nails and an overall appearance of well being. This can be attributed to the beneficial enzymes they are receiving from the juices in their diet. But why is home juicing from juicer machines better for you than the stuff you buy in the stores? The answer is simple, during the pasteurization process, the fruits and vegetables are heated up to help kill bacteria that might make you sick. By doing this tough, many vitamins, minerals and enzymes are destroyed as well. What you are left with is a sugary flavored substitute that doesn’t have the nutritional value of a home blend. On top of all that, many companies add preservatives to their juices to help them to stay fresh longer as well. As you can clearly see that getting your juice from your own juicer machine by using your own fruits and vegetables and enjoying them is the best way to go. You can even make the entire process an experience for the entire family and teach the young ones the joy of juicing.